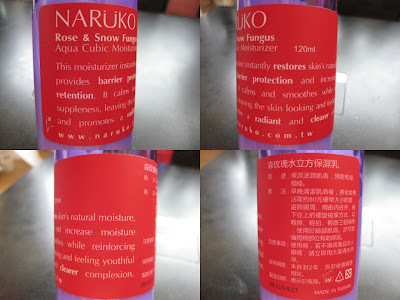 Rose Snow Fungus Aqua Cubic Moisturizer is Suitable for all skin types, especially dry, dehydrated skin. It provides in-depth hydrating and long-lasting moisture, resulting in smooth fine lines, tighten pores and soften skin. Rose Snow Fungus Aqua Cubic Moisturizer helps to keep skin healthy, tender and translucent. In the morning and evening, after cleansing, use a cotton pad to lightly soak some moisturizer (about the size of a quarter). Lightly apply from back to front (jacq: what?) and from bottom to top, avoid the surrounding eye area. Apply with gentle pressure on your entire face. We recommend using the Facial White Illuminating Cotton Pads with NARUKO toners and milky lotions for the best results. Use the textured side for toners and the smooth side for milky lotions. The cotton pads can also be used for toner face masks. PRICE: 4/5 - HKD$130/120ml *not the cheapest but very well-priced! I enjoy smoothing this on my face, either bare (as 1st step) after wash or toned with a light toner, every day and night. It is like a 'softener' you throw in with your laundry, helps very well to seals in the moisture and makes skin milky soft and supple. Another night gelly or thicker cream may be applied after this for drier skin (i.e. mine). I know the naming of these Naruko toners can be confusing, but this 'moisturizer' is actually a 'Toning Emultion' or 'Milky Lotion'. Except on humid days and oily skin, I don't think this work too well as the last-step-moisturizer. To be honest, so far I'm really really satisfied with the Rose line, the Narcissus line and the Magnolia line. The Tea tree line I haven't tried enough, whereas the Raw Job's Tears is just okay (probably because RJT doesn't have a good smell!). Especially dry skin all year round or other skin in drier seasons. Rose-lovers should try something/everything from this line! Google Friend Connect will be gone! ?